This ancient beauty secret is virtually-painless and is a natural way to restore your skin’s vibrant glow. At Bliss Wellness Center, we treat the whole body to address surface signs of aging. Good nutrition and proper digestion is important in order to nourish your skin. We customize your treatment and wellness program to your individual needs. No other treatment addresses the skin’s surface needs, while also improving your health. No Surgery. No Downtime. Amazing Results. Fine lines, wrinkles, volume loss that contributes to sagging skin, eye bags, discoloration from sun damage and scarring can be addressed with Cosmetic Acupuncture. Dr. McKendrick will tell you about your treatment options and then discuss the benefits and potential side effects. As a board-certified Functional Medicine practitioner, she is eminently qualified to perform anti-aging procedures that provide you with a range of possibilities to regain a more youthful appearance. You can count on Cosmetic Acupuncture to tonify facial muscles and increase circulation and blood flow to the face which results in a more youthful glow, skin tightening and reduction of fine lines and wrinkles. Tiny needles are placed into strategic areas of the face which have been clinically-proven to boost collagen and elastin production. 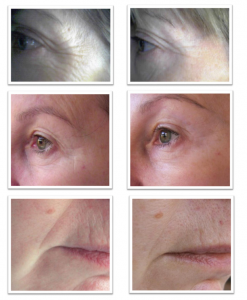 The result: you gain healthier skin and a more youthful appearance. Cosmetic Acupuncture is a natural treatment, without the use of chemicals or invasive procedures, and works by using your body’s own innate healing ability. If you want a subtle, natural-looking improvement to facial lines, wrinkles or creases, as well as bagging, sagging and volume loss, Cosmetic Acupuncture is a great treatment option. Cosmetic Acupuncture tonifies muscles and increases circulation to the face which results in a more youthful glow, skin tightening and reduction of fine lines and wrinkles. Most women and men are good candidates for this alternative approach to reduce signs of aging. You are not a good candidate for this procedure if you have hemophilia or a contagious skin disease, are currently pregnant, have ongoing migraines or have had injectables or fillers within the last 2-5 weeks. General health benefits include but are not limited to reduction in mild anxiety, stress and/or depression, reduction in hot flashes, increased energy, reduced insomnia, and improved digestion. Results can last from 2 to 5 years with maintenance. Take a look at a few before and after pictures for Cosmetic Acupuncture.